Nature, and Nature's laws lay hid in Night. God said, Let Newton be! and All was Light. This quotation from Alexander Pope, written shortly after his death, illustrates the reverence that Newton's contemporaries felt towards him, and in particular, for his work on gravitation. In the words of the French physicist Laplace, since there is only one universe, it could be given to only one person to discover its fundamental law, the universal law of gravitation that governs the motion of the planets, as Isaac Newton did in his Principia Mathematica, one of the greatest scientific books of all time. Well look at the Principia later, but first I'd like to summarise his life and his earlier works. Isaac Newton was born on Christmas Day 1642, in the tiny hamlet of Woolsthorpe, near Grantham in Lincolnshire. He was born prematurely, apparently so small that they could have fit him into a quart pot. His father had died three months earlier and when young Isaac was three his mother remarried, and he was brought up by his grandmother. This event was to scar him and could well have led to his rather unpleasant character although if things had been otherwise, Newton might have ended up as illiterate as his parents, neither of whom could sign his birth certificate. When Isaac was eleven his mother's new husband died, and he was soon to be sent away to the grammar school in Grantham. The schoolroom still exists, and his signature can be seen carved on the window sill. Newton was apparently a great one for graffiti. The local church at Colsterworth has a sundial he carved on it, apparently when he was nine, and Woolsthorpe Manor also has several drawings on the wall, supposedly by him. If I had staid for other people to make my tools and other things for me, I had never made anything of it. Its important to remember that Newton was as much a practical scientist as a constructor of grand theories. At school, his achievements gave no indication as to what would develop later, but he enjoyed mathematics there and probably learned more from his teacher, Mr Stokes, than he did later from his tutor in Cambridge. When he was seventeen, Newton returned to Woolsthorpe to manage the estate, but he was an unqualified failure. His mind was so full of problems that he wanted to solve, and he had no interest in the matters in hand. Indeed, the story is told probably apochryphal that he was once leading a horse up a hill when it slipped its bridle. Newton didn't notice, and went on leading the bridle up the hill. Fortunately, Newton's uncle, William Ayscough, rector of the nearby church in Boothby Pagnell and a graduate of Trinity College, Cambridge, and Mr Stokes, Newton's mathematics master, had both noticed his talent, and persuaded his uneducated mother that Isaac should return to school and prepare for entrance to Cambridge. Before we come to his student years at Cambridge, we should briefly mention what else was happening at the time. Newton's childhood years were highly turbulent ones with the outbreak of the Civil War in 1642 just before he was born, leading to the rise of Oliver Cromwell, the subsequent beheading of Charles I in January 1649, and eventually, after Cromwell's death in 1658, to the restoration of the monarchy in 1660 and the return of Charles II during Newton's last year at Grantham. The previous century had also been an exciting time for science, with the revolutionary advances in astronomy by Copernicus, Kepler and Galileo, the founding of the Gresham Professorships of Geometry and Astronomy in London and the corresponding Savilian Chairs at Oxford University, the invention of logarithms by Napier, the rise of experimental science as propounded in England by Francis Bacon, and the development of analytic geometry by Pierre de Fermat and René Descartes in France. Well return to some of these later, when we see how Newton built upon them. 'If I have seen further,' Newton said, 'it is by standing on the shoulders of giants'. This was not an indication of Newton's humility rather, it was a conventional remark to make at the time and had a long history: for example, there are stained glass windows at Chartres Cathedral, showing the evangelists on the shoulders of the prophets. Newton went up to Trinity College, Cambridge in June 1661. His rooms at Trinity were on the first floor near the Great Gate. Because he was not of gentry stock, he was a subsizar, required to wait on his tutor at table, clean his shoes, and do other menial tasks this lasted until 1664, when he was made a scholar. As for his studies, he did not take to the Aristotelian approach to physics and philosophy current in the ancient universities, and increasingly devoted his time to reading the great scientific works, such as Euclid's Elements. In particular, Newton spent much time studying Descartes' Geometry. This was originally a 100-page appendix to Descartes' Discourse on Method of 1637, written in French. In this work, Descartes could be said to have started a movement from geometry towards algebra, using algebraic methods to solve problems in geometry. One of these was an ancient Greek problem of Pappus of Alexandria (c. 300 AD), concerning the locus of a point that moves in such a way that it always makes fixed angles with a number of given lines. Descartes' approach to the problem was to call one length on the diagram x and another length y, and then to prove that the path of the point satisfies a quadratic equation in x and y, and is therefore a conic an ellipse, parabola or hyperbola. Thus, Descartes introduced x and y into geometry, but he did not introduce the xy-Cartesian coordinates that are named after him as they came later. In the late 1650s a much expanded Latin version of Descartes' Geometry appeared, written by the Dutch writer Frans van Schooten and incorporating many of the developments that had occurred over the ensuing twenty years. Newton spent much time on this edition, and according to the Newton scholar Tom Whiteside, reading it in the summer of 1664 made Newton into the mathematician that he became. Another writer that Newton read avidly was John Wallis, originally from Cambridge but by this time Savilian Professor of Geometry at Oxford, a post that he held for fifty-four years, until his death in 1703. Wallis had been a code-breaker for the Parliamentarians during the Civil War, and although he knew little mathematics, he was chosen for the Oxford post when in 1648 the Parliamentary Visitors replaced all the Oxford professors with Royalist sympathies. In the event, it proved to be a most successful appointment, and Wallis became the greatest English mathematician of his day, after Newton. 1 + ½ + ¼ + 1/8 + 1/16 + . . .
which go on for ever. Their sum is 2, but how can we add infinitely many terms and still get a finite answer? Wallis' book dealt with such questions. Amazingly, this important work has never been translated into English, but an English version with scholarly commentary is currently being prepared for Oxford University Press by Jackie Stedall, who wrote her PhD thesis on the mathematical works of John Wallis, and who gave a Gresham College lecture last October on the life and work of John Pell. (1 + x)½ = 1 + ½ x 1/8 x2 + . . .
Newton had an aversion to publishing his results, and his generalised binomial theorem did not appear in print until 1704, as an appendix to his Optics. Newton graduated from Trinity College in 1665, but soon afterwards had to leave Cambridge because of the plague which had devastated London and was now moving around the country. The university was closed for two years, and Newton returned to Lincolnshire not to Woolsthorpe (as it says in most books), but to Boothby Pagnell where his uncle William Ayscough was rector of the church and where there was a nice orchard of apple trees. In the beginning of the year 1665 I found the Method of approximating series & the Rule for reducing any dignity of any Binomial into such a series. The same year in May I found the method of Tangents of Gregory and Slusius, & in November had the direct method of fluxions & the next year in January had the Theory of Colours & in May following I had entrance into the inverse method of fluxions. And the same year I began to think of gravity extending to the orb of the Moon & deduced that the forces which keep the planets in their Orbs must be reciprocally as the squares of their distances from the centres about which they revolve: & thereby compared the force requisite to keep the Moon in her Orb with the force of gravity at the surface of the earth, & found them answer pretty nearly. All this was in the two plague years of 1665-1666. For in those days I was in the prime of my age for invention & minded Mathematicks & Philosophy more than at any time since. Before I talk about these in greater detail, it is worth recording that, in some sense, Newton considered himself to have been placed on earth to solve the great problems of the world how the planets move, how light and sound work, the nature of matter, and even the nature of God. For the last of these Newton, as an anti-Trinitarian, held rather unusual views, but he certainly knew his ancient Biblical texts as well as any clergyman in the country and spent more time on theology than he did on physics, using ancient sources in Latin, Greek and Hebrew to reconstruct the plan of Solomon's temple, calculate the date of the Creation, and many other things besides. However we now regard this work, we must acknowledge that, for Newton, it was an important preoccupation at least as central to his thinking as physics or mathematics. It was during this period that the story of Newton and the apple originated. We have two sources for this story his niece, who looked after him in later life, and the eighteenth-century Astronomer Royal James Bradley, who had known Newton personally. Seeing an apple fall, Newton realised that the force that draws the apple to earth is the same universal force that keeps the moon in orbit around the earth, and the earth and planets in orbit around the sun. Moreover, as Newton came to realise, this force is governed by a universal law of gravity, that the force of attraction between any two objects is proportional to the product of their masses, and inversely proportional to the distance between them so if the distance increases ten-fold, the force decreases a hundred-fold. Although his main writings on the subject were not to appear for twenty years, in the Principia, his initial ideas came from these plague years. Newton's other mathematical preoccupation was the calculus. For many years mathematicians had been working on two, seemingly unrelated, problems: how fast things move or change, and how large they are. The former, now called differentiation, concerns velocities of objects as represented by the slopes of tangents, and was known to Newton as fluxions, while the latter, now called integration, concerns finding areas under and within curves, and was known to Newton as quadrature. During the seventeenth century it was becoming clear that fluxions and quadrature were intimately related in fact, that they are inverse processes. For example, if you start with a mathematical function, such as the one that maps x to x2, or to sin x, and integrate it and then differentiate the result, you always arrive back at your starting point. This inverse relationship seems to have first been noticed in the 1640s by Torricelli, a mathematics student of Galileo and inventor of the barometer, and was later developed by Isaac Barrow, a Cambridge colleague of Newton's and Gresham Professor of Geometry from 1662 to 1664. It was Newton, during the plague years, who really explained for the first time why these processes are inverse to each other, obtaining what we now call the fundamental theorem of calculus. This work was later, and independently, developed by Gottfried Wilhelm Leibniz, leading to no end of trouble, as well see. so few went to hear Him, & fewer yt understood him, yt oftimes he did in a manner, for want of Hearers, read to ye Walls. This was recorded by his assistant Humphrey Newton (no relation), who is the only person ever to claim to have heard Newton laugh. In 1669 Newton produced De Analysi, an important mathematical treatise which he circulated to his friends but did not publish. This contained his rules for finding areas under curves, including the first formula for curves of the form y = xm/n, obtaining the formula we use today. De Analysi also contains what we now call Newton's method for approximating the solution to an equation. Two years later Newton followed De Analysi with his book on fluxions. It is most unfortunate that this was never published, as well see, as it could have prevented the priority disputes on the origin of the calculus. Up to now I haven't mentioned the Royal Society, whose early history is intimately connected with Gresham College. In the 1650s a group of Oxford scholars, sometimes known as the Oxford Experimental Philosophy School, met regularly in Oxford they included John Wallis, Robert Boyle and Robert Hooke (who together worked on the air pump and discovered Boyle's law) and the young astronomer (as he was then) Christopher Wren. In 1657 Lawrence Rooke (the Gresham Professor of Astronomy) switched over to become Gresham Professor of Geometry, and Wren was appointed in his place and the Oxford group regularly came down to London to hear them. Indeed, it was after attending a Gresham College lecture given by Christopher Wren in 1660, around the time of the return of Charles II, that they decided to form a new society later known as the Royal Society. 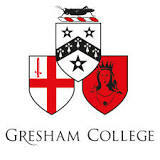 Like Gresham College, this new society was to popularise experimental science, rather than the Aristotelian variety still taught in the ancient universities. The Royal Society met in Gresham College until 1666, until they had to move out for seven years after the Great Fire. The Society's Curator of Experiments was Robert Hooke, who was Gresham Professor of Geometry for thirty-seven years. In 1672 Newton made contact with the Royal Society, presenting his design for a reflecting telescope. Newton had been interested in optics since the plague years, when he carried out his important experimentum crucis (crucial experiment) on the refraction of coloured light through prisms. Back in Cambridge he had discussed optics with Isaac Barrow, and lectured on the subject. One current difficulty was that of chromatic aberration in telescopes telescopes were becoming larger and larger, and since red and blue light are refracted through different amounts when they pass through a prism, the images were coloured around the outside red on one side and blue on the other. To avoid this, Newton proposed his reflecting telescope only six inches long and containing a mirror which solved the problem. The Royal Society elected him a Fellow in 1672. His work on light continued in 1675 when he studied the interference pattern between two plates of glass. The concentric circles that appear had been studied by Hooke, who had obtained some useful results. But Hooke's discoveries were completely overshadowed by Newton's, who used equipment that he had ground himself and who thereby obtained far more accurate results. At one stage he found an error of less than one-hundredth of an inch. He refused to ignore it but stalked it relentlessly until he found that the two faces of his lens differed in curvature … No one else in the seventeenth century would have paused for an error twice the size. The pattern is now known as Newton's rings. Needless to say, his success in this area increased the animosity between him and Hooke. It was around this time that Leibniz visited London. Leibniz had been working independently on the calculus, being more concerned with the geometry of the situation, rather than in any ideas of velocity or motion. In the autumn of 1675, Leibniz introduced the familiar integral sign and the d-notation for differentiation both of these are still used today. In 1676 Newton turned his attentions in a different direction to the classification of curves of the third degree (cubic curves). By this time it was well known that curves of the second degree, involving terms in x2, y2 and xy, were of just three different types ellipses, parabolas and hyperbolas. At that time, no-one in their right mind would have looked at the corresponding classification problem for cubic curves involving such terms as x3, y3, x2y, etc. but Newton did. By projecting the curves onto a plane, he first categorised the projections into five classes, and then by working backwards he found all 78 types of cubic curve. In 1704, as an appendix to his Optics, he published 72 of them. Why he didn't include all 78 types I don't know, because he knew all of them but it was an incredible piece of work, and many years ahead of its time. Sir Isaac replied immediately that it would be an ellipsis; the Doctor struck with joy and amazement asked him how he knew it. Why, said he, I have calculated it, whereupon Dr Halley asked him for his calculation without any further delay. Sir Isaac looked among his papers but could not find it, but he promised him to renew it, and then to send it to him. Newton set to work and produced his De Motu Corporum in Gyrum (On the motion of bodies in an orbit) in late 1684. This he expanded over the next two years, with much encouragement, cajoling and flattering by Halley, eventually producing the Principia Mathematica, which was published in 1687. But it very nearly didn't appear. Hooke complained that a result of his was not credited, and Newton refused to do so. Moreover, the Royal Society, who should have paid for the publication, ran out of money after producing a very expensive History of Fishes, and so Halley himself paid for the entire publication. His only recompense from the Royal Society was fifty free copies of the History of Fishes plus a further twenty copies for lack of earnings. Then ye who now on heavenly nectar fare, Come celebrate with me in song the name Of Newton, to the Muses dear; for he Unlocked the hidden treasuries of Truth: So richly through his mind had Phoebus cast The radiance of his own divinity. Nearer the gods no mortal may approach. This is followed by Newton's three laws of motion: first, the law of inertia, derived from Galileo, that every body continues in its state of rest, or of uniform motion in a right line, unless it is compelled to change that state by forces impressed on it; second, the change of motion (that is, the acceleration of the body) is proportional to the motive force impressed; and is made in the direction of the right line in which that force is impressed; and third, that to every action there is an equal and opposite reaction. If I press on a table, then the table presses back on me. The main part of the Principia consists of three books, of which the third The System of the World, is the climax. Newton recommends that the reader proceed directly to this third book, referring back whenever necessary. But well go through them in order. The main purpose of Book I is to explain Kepler's laws of planetary motion, so lets remind ourselves of these. In 1543 Copernicus had proposed that the planets travel in circular orbits around the sun, in contrast to the Greek Ptolemaic system in which the sun and planets orbit the earth. Johannes Kepler, using the extensive and highly accurate observations of the Danish astronomer Tycho Brahe, observed some discrepancies, and was eventually to ditch the circles and propose that the planets move in elliptical orbits with the sun at one focus. Kepler was very interested in conics, and the word focus (actually, Latin for fireplace) is due to him. Assuming the existence of an inverse-square law of gravity, Newton proved Kepler's law, that the planets orbit in ellipses and also obtained the converse result, that if a planet under a central law of gravitation travels in an elliptical orbit, then the law of gravity must be an inverse-square one. Kepler's second law was that the line from the sun to each planet sweeps out equal areas in equal times: if it is far from the sun it travels slowly, and if it is near the sun it travels fast but it always traces out the same area of sky in any fixed period of time. Newton's proof of this appeared in his Proposition 1 of Book I.
Kepler's third law concerned the periods of different planets that the square of a planets period is proportional to the cube of its orbits mean radius. This was also proved by Newton in Book I, under the assumption of an inverse-square law of gravitation. Book II is concerned with the movement of objects in resisting media such as a ball bearing in treacle. Here, Newton demolished a rival theory of the universe due to Descartes, that all the planets move around the heavens in mini-vortices, or whirlpools. In Book III, Newton obtains a number of amazing results these include the calculation of the speed that a projectile needs to travel in order to escape from the earths atmosphere; results on the precession of the equinoxes; the motion of comets; and the shape of the earth as it rotates. This last one proved to be decisive. Under Newton's hypotheses, the rotation of the earth causes a flattening at the poles so that the earth is onion-shaped, whereas under Descartes' vortex theory the rotation of the earth causes an elongation at the poles so that the earth is lemon-shaped. It was not until the late-1730s, when geodetic missions were sent to measure the time-periods of a pendulum in Lapland near the North Pole, and in Peru on the equator, that Newton's prediction was found to be correct. Newton has very few readers, because it requires great knowledge and sense to understand him. Everybody however talks about him. The logical structure is slipshod, its level of verbal fluency none too high, its arguments unnecessarily diffuse and repetitive and its very content on occasion markedly irrelevant to its professed theme … but these faults … can largely be excused by the very rapidity with which the Principia was written. Newton found that he enjoyed all this adulation, and he became a public figure. When the Catholic King James II demanded that Cambridge University award a degree to a Benedictine monk, Newton was one of the delegation that protested without success to the infamous Judge Jeffreys. The next year he was elected Member of Parliament for Cambridge University Oxford and Cambridge Universities had separate MPs different from those for Oxford and Cambridge themselves, until the Second World War. He probably wasn't a very good MP: it is said that he spoke only once to ask a steward to open a window. By 1696 Newton felt the need to go to London, and in that year he was appointed Warden of the Royal Mint, living in the Tower of London. Although the post was normally a sinecure, Newton became fully involved, introducing milling on the edge of coins to counteract the shaving of silver by forgers and Newton was quite content to send forgers off to be hanged for their crimes. For his pains, Newton was promoted to Master of the Mint in 1701, and relinquished his Lucasian Chair in Cambridge. In 1703 the ailing Robert Hooke died, and with him out of the way Newton felt happy to become involved again with the Royal Society, which had become almost defunct. He worked tirelessly for this institution, resurrecting it, especially since Gresham College had becoming somewhat inactive and wanted to expel the Royal Society from its premises. Eventually, Newton found new premises in Crane Court, and built up the Royal Society from there. For some inexplicable reason, the portrait of his rival Robert Hooke got lost in the move, so that now we have no likeness of him. It was a good time for Newton. In 1704, with no Hooke to disagree with him, he published his second-greatest book, the Opticks. Unlike the Principia, which was difficult to understand and written in Latin, the Opticks was in English and easy to read, describing in user-friendly terms the results of various optical experiments. The next year, Newton was knighted by Queen Anne and became the first scientist ever to be so rewarded although it was probably for his work at the Royal Mint, rather than his scientific work, that he was recognised. As President of the Royal Society, the senior scientific post in England, Newton was in a position to wield great power and he did, often ruthlessly. He arranged for his supporters to be appointed to appropriate positions for example, it was almost certainly Newton who secured the post of Astronomer Royal for Edmond Halley, following the death in 1720 of John Flamsteed, another of his rivals. One very unpleasant example of Newton's behaviour was the report, the Commercium Epistolicum, on the origins of the calculus. As we have seen, Newton was probably the first to obtain his important results on the calculus, but he did not publish them. Leibniz, working independently, introduced a far better notation, that we still use, and then published his results (somewhat obscurely, it must be admitted) in 1684 and 1686. The Swiss brothers Jakob and Johann Bernoulli then developed Leibniz' work and in their hands, and those of Leonhard Euler and others, Continental calculus then moved ahead in leaps and bounds, while British calculus remained largely at a standstill. There was so much ill feeling between Britain and the Continent on the priority issue, that Newton arranged for an independent commission to investigate the issue. For this purpose, Newton chose the members of the commission, and wrote much of the evidence for them to consider, so you can guess how they decided. In the 1720s Newton became increasingly ill with gout and other ailments, and he died in March 1727 at the advanced age (for those days) of 84. Here's his death mask. He lay in state in Westminster Abbey for a week preceding his funeral. At the ceremony, his pall was borne by two dukes, three earls and the Lord Chancellor. No previous scientist had ever been so honoured.